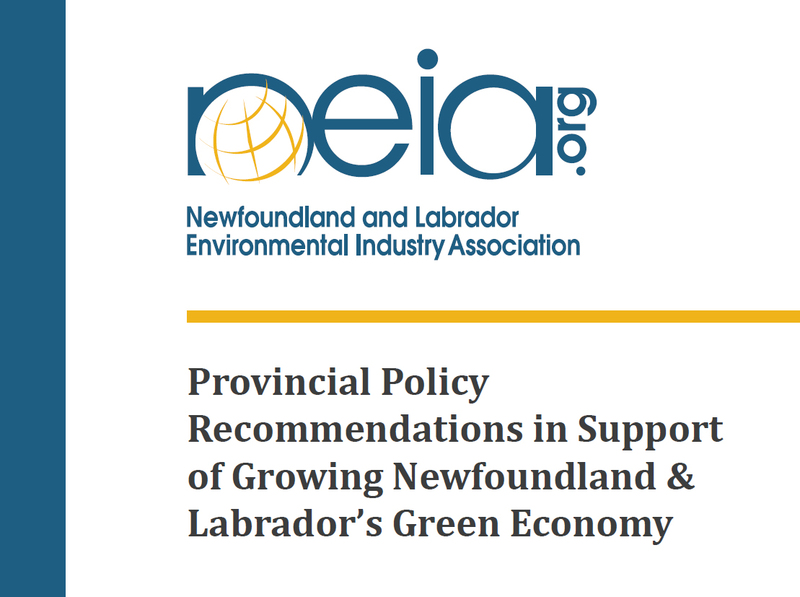 ST. JOHN’S, NL – The Newfoundland and Labrador Environmental Industry Association (NEIA) has published a document outlining provincial policy recommendations in support for growing Newfoundland and Labrador’s green economy. The policy document, which addresses opportunities in areas ranging from innovation, to public transportation, to carbon pricing, to environmental enforcement, can be downloaded at http://neia.org/recommendations/. Lomond notes that the priorities which emerged from consultations were organized in the document in to four distinct areas: recommendations which support (1) the growth of the provincial green economy at large; (2) environmental sector business operations; (3) firm-level growth; and (4) specific environmental / economic issues. “This is intended to be a living document,” explains Lomond. “We welcome further commentary and input from all stakeholders on the recommendations we have made, with an eye to fostering green economy growth in Newfoundland and Labrador in the best way that we can.” To facilitate broad discussion, NEIA has created online tools at www.neia.org/policy, where comments can be made directly on each recommendation. “Our members, who were extensively consulted in the development of this document, are hopeful that discussion around these recommendations leads to a sustained dialogue between government, industry, academia, and the public on the future of green business in Newfoundland and Labrador,” says Lomond.